The Tarot des Centuries is also known as the Nostradamus Tarot. 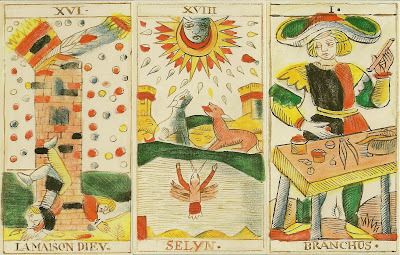 It is partly copied from the Tarot made by Jean-Pierre Payen around 1760 and partly redrawn from a seventheenth-century manuscript found in France. Dominique Webb claimed that the manuscript, on which tarot-cards were drawn, was inspired by Nostradamus. The cards are partly "renamed" according to Nostradamus work. E.g. the Magician became "Branchus" a prophet in Asia Minor, because Nostradamus described the rite of Branchus, performed with a tripod, such as pictured usually in the Magician. 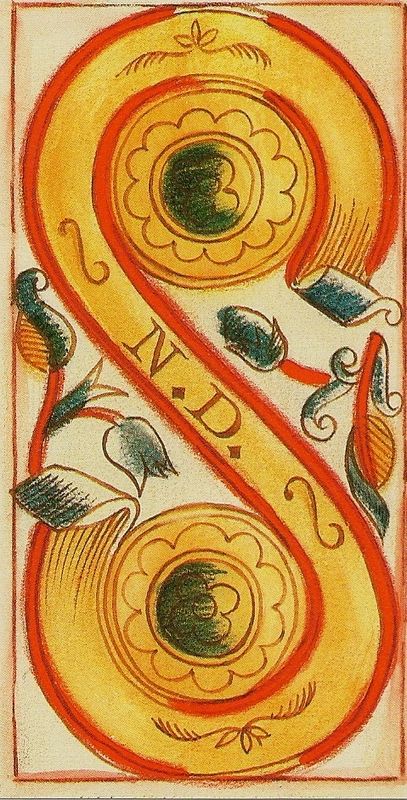 On the two of coins and the two of cups "N.D." for Nostradamus is replacing the name of the original maker, Payen. Nostradamus (1503-1566) has written a book of prophecy known as the Centuries. Although tarot cards were known in France during Nostradamus's lifetime, there is no reference to them in his works.